The barn owls at Eaglecrest laid their first egg on 2/19/13. They are nesting in a hole in the tree just below the nest tray that the geese are using. The Countess (also called 'Tess) will most likely lay four to six small eggs that should begin hatching after roughly 33 days, or on March 24. Unlike the geese, barn owls are asynchronous layers - that is, they don't delay incubation to assure that all of the eggs hatch at roughly the same time. The eggs will hatch in the order they were laid, and there may be an age difference of up to three weeks between the youngest and the oldest nestling. The young birds are brooded for about two weeks and fledge in 50 to 55 days. Barn owls are one of two living lineages of owls. Most owls are classified as Strigidae, or typical owls - a name that appears to have derived from the Greek word strix, meaning screecher. Barn owls are Tytonidae, derived from tyto, a word that means either owl or honored. I've already done a blog post on the features and adaptations that all owls share: facial disks, large forward facing eyes, 'soft' feathers, round heads, distinctive facial markings and/or ear tufts, talons and a 'hawk-like' beak. However, there are also some differences between the two. The heart-shaped facial disk of a barn owl has different directional properties than that of its round-faced cousins. If it were a microphone, we'd call it cardioid. The heart shape isolates sound sources and concentrates sound in front of the owl, obscuring sound from the sides and rear. Like its uneven ear holes, this helps it pinpoint prey. Its large head also means a larger facial disk with which to pick up sound. 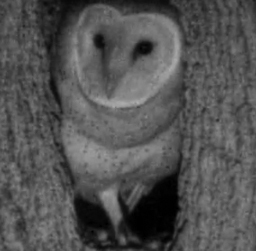 These specialized adaptations help barn owls hunt in very low light to complete darkness: a critical skill for barn owls, since many nocturnal animals curtail their activities to dens and burrows when the moon is full. A barn owl's long, sparsely feathered legs help it catch mice, shrews, and voles in deep vegetation and underneath snow. Its third toe has a split talon that can be used as a comb. Perhaps their long legs aid in grooming, or help them avoid bites and scratches from prey. Or maybe tytonidae owls really like tall, long-legged mates. We know that dark spots on a female barn owl attract males - the larger and darker her spots, the more interested male owls get. Could long legs serve a similar function? The lack of feathered tufts is also a mystery. Since some but not all Strigidae have ear tufts, I'm guessing - and this is a guess - that the common ancestor of all Tytonidae and all Strigidae did not have ear tufts (which are not at all related to ears or hearing). Therefore, the question should be 'why did some Strigidae develop ear tufts?'. Researchers have proposed camouflage, species recognition, and signaling under low-light conditions, but no one knows for sure. Barn owls are at the very low end of the avian acuity and contrast sensitivity spectrum. Perhaps they never developed ear tufts because they aren't likely to benefit from whatever visual cues, sexual attractiveness, or camouflage ear tufts provide to owls that have them. 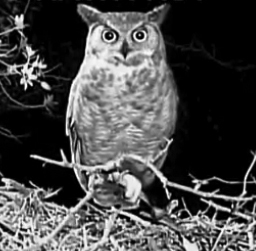 Eaglecrest makes it possible for us to watch great horned owls and barn owls in the same territory. You can see why barn owls have been called 'ghost owls' and 'night owls' - their silent flight and vocalizations can seem a little eerie. They are very different from their louder, showier Strigidae cousins. Barn owls nest in cavities, returning to the same cavity year after year to lay eggs and raise young. Great horned owls commonly usurp the stick nests of other birds, while a barn owl makes a simple nest of her own regurgitated pellets, shredded with her feet and arranged into a cup. I'll be watching for more differences as they incubate eggs and raise young. Barn owls are more effective than poison and traps at controlling rodent populations. If you have suitable habitat and are interesting in building a barn owl box, click here for directions from the Missouri Department of Conservation. If the geese follow the same pattern this year, we should see an egg roughly every two days, with full incubation beginning about the time the last egg is laid. Hatch should start 24-28 days later: last year took 27 days. 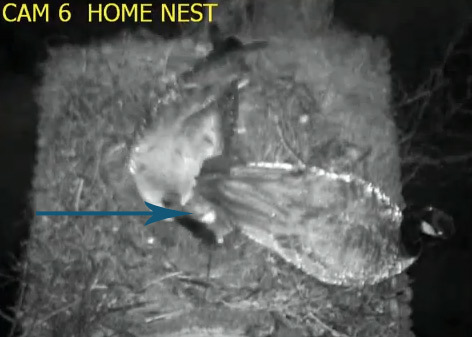 The goslings will jump from the nest within about 24 hours of hatch. We'll be able to watch the family swimming in the pond, but they will not come back to the nest once they've left it. Mother goose won't begin full incubation until around the time her last egg is laid. Embryonic growth and development is a fast-paced chemical process that requires heat. By delaying incubation, mother goose delays the onset of embryonic development and assures the synchronous hatching of fertilized eggs. Synchronous (closely-timed) hatching is especially important in the case of Canada geese and similar birds, which leave the nest roughly 24 hours after hatching. Unhatched eggs or birds too young to follow their parents die. I used to think that eggs would die if birds stopped sitting on them for even brief periods of time. Not true! Embryos are less sensitive to cold than to heat, particularly before incubation has started, and few birds incubate continuously. Wilma will regulate the temperature of her eggs by varying the amount of time she sits on them, and the tightness of her sit. If the weather is warm and sunny, she may spend a great deal of time off the eggs. We also might see her cover the eggs with soft nesting material. I'm going to drop some words on you readers. Canada geese are precocial - that is, the young are relatively mature and mobile from the moment they hatch. They are born with their eyes open and can swim, run, and jump shortly after leaving the egg. This is important, since precocial species are normally nidifugous, meaning they leave the nest shortly after birth or hatching. Just before hatching, the goslings will consume whatever yolk and albumen remains in their eggs. This provides enough food energy for the next 24 to 48 hours. Once they've jumped from the nest, their parents will lead them to water and protect them from predators. Wilma and Fred do not need to provide food in the nest, and the goslings will find food (mostly) on their own once they reach the water. Roughly 24 hours after hatching, Wilma will leave the nest and the goslings will jump after her. While this seems scary, it is very normal for geese. Canada geese have been documented nesting on heron nests, osprey nests, cliffs, and man made structures. Nesting in high places helps protect eggs and very young babies from ground-bound predators including raccoon, coyotes, opossums, cats, and dogs. The jump is over very quickly. Dad Fred will be waiting on the ground below to help protect his family. Wilma will fly down from the nest and honk for the goslings, who will quickly follow her out of the nest. Their light weight and downy bodies will help protect them from injuries when they land on the soft grassy surface below the nest, and Eaglecrest staffer Ramblin' Raptor will also put out straw or grass to help cushion their landing. Once the goslings have landed, their parents will lead them directly to the pond, honking and hissing all the way. I've often heard Bob say that birds wouldn't do it if it didn't work. Successful behaviors lead to more offspring to pass those traits on to. Geese that are good at synchronous incubation will have better offspring survival rates than those that aren't. Geese that nest high will lose fewer eggs and young to ground-based predators, offsetting potential losses caused by landing injuries. Whatever we might think as human watchers, Fred and Wilma are following a way of life that has produced more winners than loosers. Mama (goose) knows best. Although we haven't seen it in Decorah before, multiple nest building is a relatively commonplace activity: in most but not all instances bald eagles will have more than one nest in their breeding territory. According to Pat Schlaurbaum from the Iowa DNR: "Alternative nests are quite common for a species that exhibits compulsive nest building behavior. While many alternative nests are active immediately, there are instances where eagles relocate from the alternative nest and return to the original nest and vice versa." While we are disappointed that the eagles have left the original nest, they are simply doing what eagles do. Pending approval and support from all landowners, we will install cameras near the new nest in the fall of 2013. Cameras at both nests will assure that the public will be able to follow these famous eagles. The Raptor Resource Project has many other bird cams across the country. Our Bald Eagle Cam in Colorado has been operating for close to ten years and allows viewers to switch between two cameras. We also have Falcon Cams, Red-tailed Hawk Cams, a Vulture Cam, a Kestrel Cam, a Great Blue Heron Cam, and Owl Cams that can viewed fromwww.raptorresource.org. Click on ‘bird cams’ on the top of the page to view them. You can also get the latest news from our facebook page, read more about multiple nest building (and many other topics) on our blog athttp://raptorresource.blogspot.com/, or chat with other bird fans in our forum: http://www.raptorresource.org/forum/. We will update on the new nest on facebook as we are able. We look forward to bringing to the Web a new species of eagle from another part of the planet. The Philippine Eagle is on the brink of extinction and we have been working with the Philippine Eagle Foundation to bring a live Philippine Eagle Cam to the world. We are hoping that we can use the power of the Web to both educate and initiate efforts to help save this species. This is everything that the Raptor Resource Project stands for. Falcon 72/N, a 2011 hatch from the Allen S. King plant . We sometimes get asked why we band birds. Bird banding allows us to study the movement, survival, and behavior of the birds we band, and get life histories for at least some of the birds we watch. Bird banding has helped researchers gather information on mortality rates, dispersal patterns, migration, behavior, social structure, and seasonal and long-term population trends. It allows us to track individual peregrine falcons, giving us an intimate look at how a species behaves as it recovers, grows, and eventually reaches stasis with its environment. Without bird banding, we could not track the success of our cliff recovery program, know the history of any given site from year to year, or track the ebb and flow between urban and cliff-nesting populations. We would not know that female falcons tend to stay within 200 miles of their natal nests, that males tend to stay within 70 miles of their natal nest, and that Zeus, the male at Woodman Tower in Nebraska, was a real outlier (Zeus was released in Rochester, New York: a straight-line distance of 945 miles). 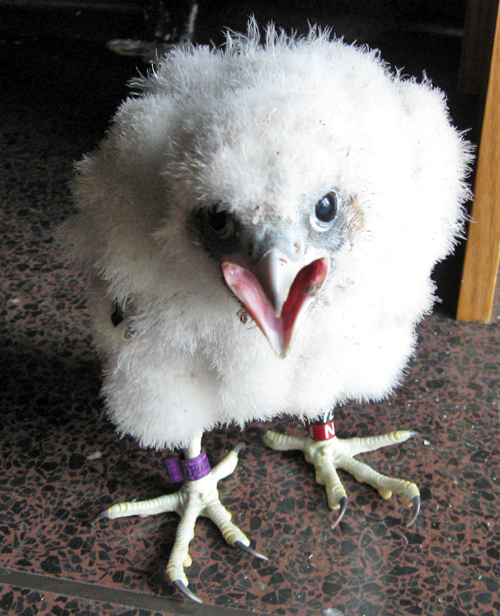 The leg bands we use do not harm birds or adversely affect their survival rates. Bird banding has a long and storied history. In 254 BC, Quintus Fabius Pictor recorded the use of birds as message carriers by the Romans. Pliny noted the use of birds as messengers in his Natural History, completed in 77 AD, and Marco Polo, writing on falconry in Asia between 1275 and 1295, stated: "Each bird belonging to the sovereign and the Barons has a tablet of silver on its feet, with its name and that of the owner inscribed so that wherever caught it can be returned to him." Metal bird banding in Europe also began as a way for royal falconers to identify and recapture escaped or stolen birds. Recorded recaptures include a falcon owned by Henry IV, which escaped at Fontainebleau and was recovered in Malta, 1,350 miles away, and a Canary falcon owned by the Duke of Lerma, which flew from Anadalusia to the island of Teneriffe, a distance of 750 miles. At some point, royalty began banding other birds on their royal forests and hunting land, including blue birds, herons, ducks, buzzards, swifts, and storks. Methods included collars, leg rings, and plates. Although many sovereigns and scholars were enthusiastic about marking birds, systematic bird banding as a means of studying bird populations didn't begin in Europe until 1899, when a Danish schoolteacher named Hans Christian Mortensen began putting aluminum rings on starlings, storks, ducks, and larger birds of prey, inscribing them with his name and address in the hope they would be returned. Although the practice was somewhat controversial, Mortensen received so many interesting returns that others quickly followed. By 1909, ornithologists and enthusiasts were banding birds for study in East Prussia, Ireland, England, Hungary, and France. In addition to Cole and Audubon, other important names in early American bird banding include Dr. Paul Bartsch, who began tagging black-crowned night herons in 1902, P. A. Taverner, who furnished 200 hand-made aluminum bands to his correspondents, Jack Miner, who began banding in 1909 and tagged his 20,000 goose in 1939, and Dr. John B Watson, who conducted the first American homing experiment, also in 1909. James Audubon is widely acknowledged as the first bird bander in the Americas, but it was ornithologist Leon J. Cole who introduced the concept of scientific, systematic bird banding on this side of the globe. Early bird banding efforts were personal and haphazard: individuals and groups used their own private markers, IDs, and tagging methods. As Harold Wood reports in A History of Bird Banding: "A Duck Hawk (note: Peregrine falcon) was found at Cape Canaveral, near Palm Beach, Florida, December 10, 1888, with a tin cap-box attached to its neck by a wire and bearing a message within dated October 10, 1888." An enthusiast had trapped the Peregrine and released it from the Frying Pan Shoals Lightship off Cape Fear, slightly less than 200 miles from the place where it was found. A more dramatic example was found on a mallard duck shot in North Carolina in January 1910, which read "Have Faith in God! Write Jack Miner, Kingsville, Ont." Standardized tags had yet to be developed. In the early 1900s, concern over declining numbers of some birds, including waterfowl and passenger pigeons, lead to an international agreement to manage migratory birds. The Migratory Bird Convention was signed by Canada and the United States in 1916. 1920: Under the leadership of Fredrick Lincoln, the US Bureau of Biological Survey takes on overseeing the Migratory Bird Convention and coordinating banding activities in North America. The Bird Banding Laboratory (USA) and the Canadian Bird Banding Office manage permits, supply bands and keep records. Data on all birds banded in North America is kept in Washington, D.C. Between 1920 and 1946, Lincoln organized the banding office, developed numbering schemes and record keeping procedures, recruited banders, established standards, fostered international cooperation, and promoted banding as a tool in scientific research and management. 1936: Mexico joins the Migratory Bird Convention. 2011: More than 64 million birds have been banded in the United States and Canada, according to records received by the BBL. About 3.5 million of these bands have been recovered and reported back. On average, about 1.2 million birds are banded every year. Look for the next banding blog on Tuesday, February 12. I'll talk about the specifics of what we do and how to read and report bands. Where are the Decorah Eagles going to nest? We are getting this question on a very regular basis and we still don't have an answer. Initially, they were dividing their time fairly equally between the two nests, spending about 50% of total nest time in or near each nest. They went through a brief flurry of activity at the original nest towards the end of January, which made us think they might be using the original nest after all. However, much of the activity at the original nest has subsided and we've seen them spending a little more time at the new nest. They also haven't started bringing many soft nesting materials into the nest yet, something we thought should be in full swing by now. Having said that, we aren't ready to concede the original nest. They've been making visits on and off, and we haven't yet observed them bringing soft nesting material into yonder nest. We're trying to watch them just a little bit closer, since soft nesting materials might tell us one way or another. We'll keep you posted, and please let us know if you see anything. 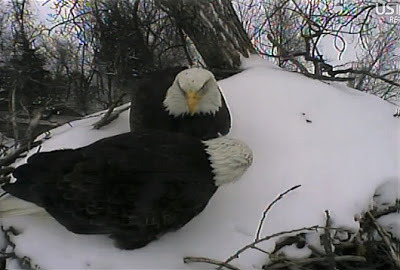 In the meantime, here's a video highlight of a visit to the original nest on 02/05/13: http://www.ustream.tv/recorded/29053339/highlight/322844. You can also see it on our youtube channel at http://youtu.be/FcxOk2ndlgE. Enjoy!